In the Atlantic Ocean, the densest water mass Antarctic Bottom Water “AABW” can only cross the Mid‐Atlantic Ridge from its southwestern to northeastern basins in limited, because deep, conduits. At the southwestern entrance of one of these, the equatorial Romanche Fracture Zone, AABW crosses a sill at 4550 m depth in a 7 km narrow channel before plunging into the deep. At the sill‐slope, the rapidly flowing AABW causes shear‐induced turbulent mixing with the overlying water masses. 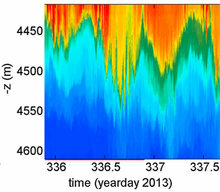 We present an excerpt of 1 Hz sampled, half‐yearlong moored observations from 99 high‐resolution temperature sensors that demonstrate and quantify the turbulence details. On top of quasi‐steady shear flow, an internal tide modulates the mixing. Together, they constitute a means for an extremely long train of >250 consecutive Kelvin‐Helmholtz billows in a day that vary between 5 and 100 m in vertical scale.